Latest News: Indian Navy issued a new notice regarding Chargeman applications cancellation. New dates yet not issued by the authority. You can check this notice from below given table. All the candidates who are looking for Indian Navy jobs are informed that the official notification for Indian Navy recruitment 2018 has been published. Applications for this recruitment will be done through online mode. The application for this will start from April 16, 2019. Candidates will be able to fill the form by April 28, 2019. There are a total of 172 vacancies. Candidates who are eligible in all cases of notification, eligible criteria can apply before the end date. 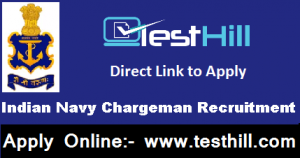 Department of Indian Navy has issued official notification regarding the Indian Navy Chargeman Recruitment 2019. To fill the declared recruitment Chargeman profiles, there are a total of 172 Indian Navy vacancy. Indian Navy Chargeman Recruitment 2019 application is available on the official website ie www.joinindiannavy.gov.in. You can go there and see it, they can see it at www.testhill.com. here will be two stages in the selection process. Candidates will select based on their scores and a list will be created. Shortlisted candidates must be included in the written examination. This test will come from General English, Numerical Aptitude, General Awareness and Reasoning and Awareness, Applied Science & Specialisation in the relevant trade. Candidates need to prepare for the examination from these disciplines. Candidates will have to download their admit card to join the written examination. Indian Navy Recruitment 2019 Admit Card will be available on the official website. Candidates will be able to download it from there. They need to provide some required information like registration number, application number, and birth date/password. After filling this information, the admit card will be displayed on your computer screen. Candidates can download it here and can take printouts for the exam. Chargeman Ammunition & Explosive:- Candidates who have completed a Diploma in Chemical Engineering from an accredited Board with two years of work experience. For general & OBC category candidates, an application fee of Rs.205/- is required.